Initiated by University President Michael K. Young in 2005, the Campus Master Plan gives physical form to the University’s mission to engage, prepare, and partner with our neighbors, national and international friends, and campus students, faculty, and staff. The University has hired Skidmore, Owings and Merrill LLP (SOM), San Francisco, to assist in the development of the Campus Master Plan. As part of the overall Campus Master Planning effort, this public website provides an avenue for keeping all interested parties informed of the opportunities for input and involvement. It also serves as the bulletin board for project updates throughout the planning process. The Campus Master Plan was introduced at the Community Forum of March 27, 2007. Inquiries about the Campus Master Plan may be addressed to the Office of Campus Planning at (801) 585-6751. The 2008 University of Utah Campus Master Plan is complete and now available in PDF format. The PDF is organized below by section. The document is in an 11″x11″ format. Due to the non-standard size, printed copies may be requested through University Print & Copy Services. To obtain pricing information or to place an order for a printed copy, please visit the University Print & Copy Services Web site at www.printing.utah.edu or call 801-581-6171. The process for updating the University’s Campus Master Plan is complete. The updated plan was presented to and approved by the University’s Board of Trustees on June 9, 2008 and by the State Board of Regents on September 5, 2008. The PowerPoint presentation made to the Board of Regents is available below. 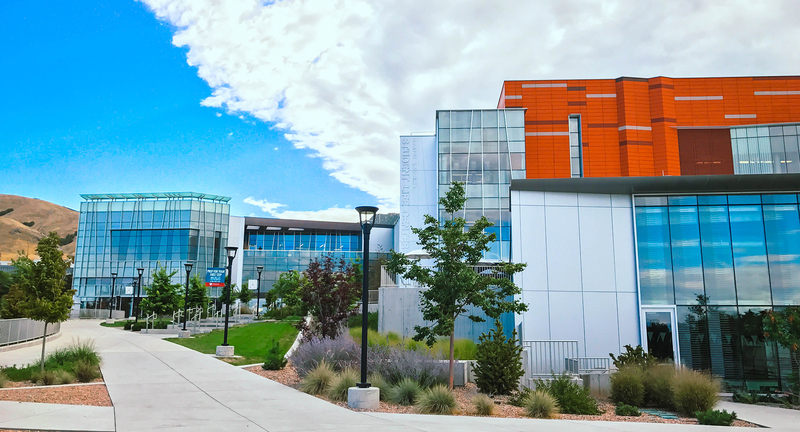 The update to the University of Utah’s Campus Master Plan has been underway since early 2007, led by the efforts of Skidmore, Owings & Merrill LLP (SOM) and the University Campus Planning Department with the collaboration of campus and community members. This effort has been guided by the goal of creating a vibrant campus for students and an inviting atmosphere for the greater community. The process for updating the Campus Master Plan included public meetings for faculty, staff, students along with the surrounding community. Other avenues for submitting input have also been provided. Inquiries about the Campus Master Plan may be addressed to the Office of Campus Planning. The University of Utah is pleased to announce the release of its 2011 Bicycle Master Plan. Along with the proposed bikeways, the Plan recommends various bicycle-friendly policies and programs to promote bicycle ridership among students, faculty and staff. It emphasizes both campus pathways and on-street facilities that connect the core campus area with surrounding neighborhoods. The Bicycle Master Plan gives guidelines for facilities and programs that are within the University’s jurisdiction. It also provides recommendations for the University to work with external entities such as UDOT, UTA, and Salt Lake City to improve bicycling conditions in locations that are important to the campus environment, but which are not under the University’s direct control. The University is committed to making bicycling a real factor in its set of transportation tools. If you have questions or comments regarding bicycling on campus, contact the U’s Active Transportation Manager, Ginger Cannon or visit the Sustainability Office website. A PDF version of the 2011 University of Utah Bicycle Master Plan, an addendum to the University of Utah’s Campus Master Plan, can be downloaded and viewed here. Other supplemental information can be found below.